For the monument to Robert Peel in Bury, Greater Manchester, see Peel Monument. Peel towers (also spelt pele) are small fortified keeps or tower houses, built along the English and Scottish borders in the Scottish Marches and North of England, intended as watch towers where signal fires could be lit by the garrison to warn of approaching danger. By an Act of the Parliament of England in 1455, each of these towers was required to have an iron basket on its summit and a smoke or fire signal, for day or night use, ready at hand. Peels were built in Northumberland, Cumberland, Westmorland and North Riding of Yorkshire, and as far south as Lancashire, in response to the threat of attack from the Scots and the Border Reivers of both nationalities. Canons Ashby incorporates one of only a few Peel towers constructed in the Midlands; it owes its existence to the settlement of Cumbrian sheep farmer, John Dryden, in the county of Northamptonshire. A line of these towers was built in the 1430s across the Tweed valley from Berwick to its source, as a response to the dangers of invasion from the Marches. In the upper Tweed valley, going downstream from its source, they were as follows: Fruid, Hawkshaw, Oliver, Polmood, Kingledoors, Mossfennan, Wrae Tower, Quarter, Stanhope, Drumelzier, Tinnies, Dreva, Stobo, Dawyck, Easter Happrew, Lyne, Barnes, Caverhill, Neidpath, Peebles, Horsburgh, Nether Horsburgh Castle, Cardrona. Apart from their primary purpose as a warning system, these towers were also the homes of the lairds and landlords of the area, who dwelt in them with their families and retainers, while their followers lived in simple huts outside the walls. The towers also provided a refuge so that, when cross-border raiding parties arrived, the whole population of a village could take to the tower and wait for the marauders to depart. 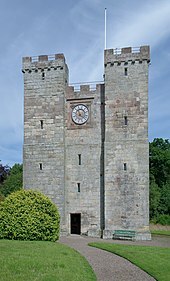 Peel towers can be associated with a church: for example Embleton Tower in Embleton, Northumberland, is an example of a so-called vicar's pele and the one at Hulne Priory is in the grounds of the priory. Hawkshaw, ancestral home of the Porteous family at Tweedsmuir in Peeblesshire, a peel tower dating from at least 1439, no longer stands but its site is marked by a cairn. St Michael's Church, Burgh by Sands has a heavily fortified tower at the west end and a former vicar's pele at the east end. Some peels were converted to castles, such as Penrith Castle. Some towers are now derelict while others have been converted for use in peacetime. Embleton Tower is now part of the (former) vicarage and that on the Inner Farne is a home to bird wardens. The most obvious conversion needs will include access, which was originally difficult, and the provision of more and larger windows. A peel tower in Hellifield, North Yorkshire featured in an episode of Grand Designs showing the conversion from a derelict state to a home and a bed-and-breakfast business. ^ Fraser, G. M. (1971). The Steel Bonnets: the Story of the Anglo-Scottish Border Reivers. London: Pan. ^ Historic England. "Strickland's Pele Tower and Penrith Castle (1010690)". National Heritage List for England. Retrieved 30 July 2018. ^ Wilkinson, Paul (15 Feb 2007). "How I peeled back the years". The Daily Telegraph. ^ McCrum, Kirstie (20 Oct 2016). "'Haunted' 15th Century Scottish castle with 'ghosts in the grounds' could be yours for £695,000". Daily Mirror. Archived from the original on 22 Aug 2017. This article incorporates text from a publication now in the public domain: Wood, James, ed. (1907). "Peel Towers" . The Nuttall Encyclopædia. London and New York: Frederick Warne. "Peel Towers, the name given to fortresses of the moss-troopers on the Scottish border". p. 490.